The main thing I wanted was the Guerlain La Petite Robe Noire Deliciously Shiny Nail Colour, which I did get in Black Perfecto (007). 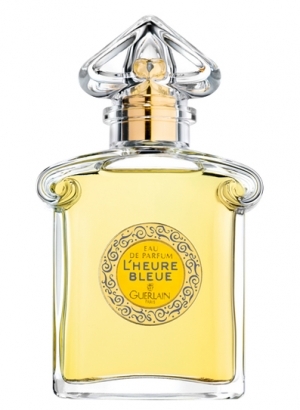 The bottle design is based on a classic Guerlain fragrance bottle style, which is used to house some of their perfumes like L’Heure Bleue, Mitsouko, and the much newer La Petite Robe Noire (not personally a fan, though I am in love with the other two). The cap looks like an upside-down heart! 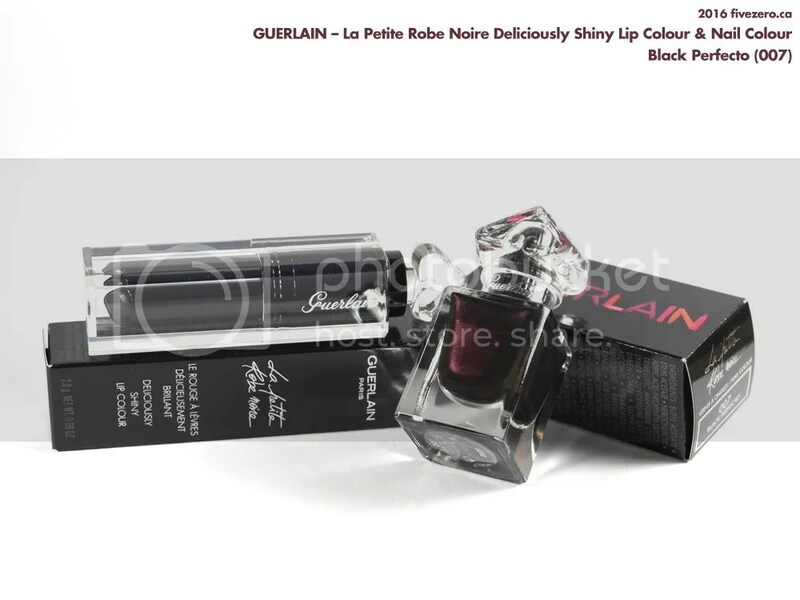 I initially went to the counter with a speckly turquoise Anna Sui nail polish (one of the darling bird-topped bottles, $15), but ended up swapping it for the new Guerlain La Petite Robe Noire Deliciously Shiny Lip Colour (007), since I hadn’t quite reached the $200 mark. The shade is Black Perfecto, same as the nail polish, and it swatches like a shimmery version of Clinique Almost Lipstick in Black Honey. I hope like hell that the nail polish isn’t as sheer as that, though! And, I know I said I didn’t want to get more lipstick, but the Guerlain was too gorgeous! I was weak. Plus, the only other Guerlain nail color that spoke to me was a red-orange, which I thought was a little too close to the Chanel Gitane that I was also getting, and I couldn’t be sure I would like the Guerlain nail polish formula. Also, I noticed that the Chanel prices have gone up by a dollar, and I seem to recall the Météorites being a bit cheaper last year, as well—at Sephora, anyway. 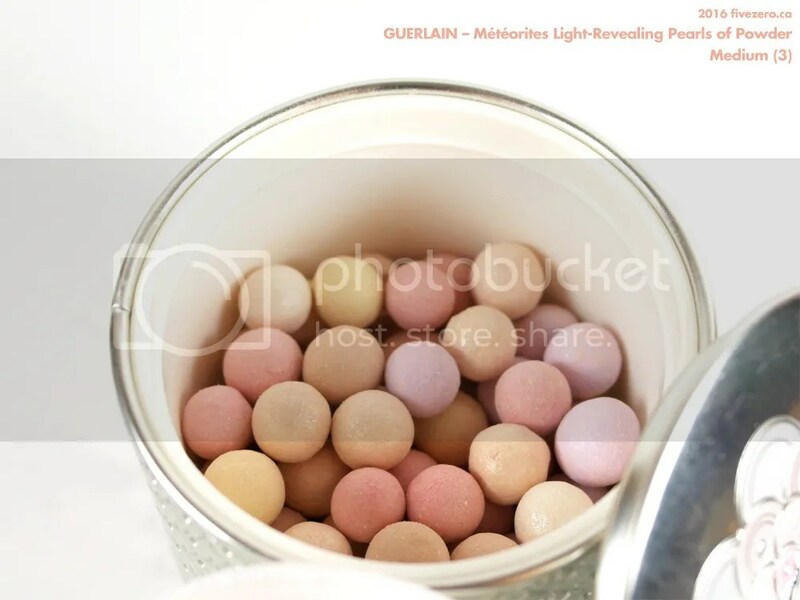 Still, when it’s “free”, you can’t really complain too much, so I finally caved and got my very first Guerlain Météorites Light-Revealing Pearls of Powder in Medium (3). It bugs me a little that “Light-Revealing” is hyphenated on the box, but not on the sticker on the bottom of the Météorites tin. Hmmph. However, the balls—sorry, pearls!—look so pretty in the beautiful little tin, and they smell like freakin’ violet candies. Yaaas! I showed it to DH, as it was the most expensive of my redemption acquisitions. FZ: I got Guerlain balls! Mr. FZ picks up the tin and shakes it. FZ has mini heart-attack and snatches the tin away from Mr. FZ. FZ: Nooooo they’re little balls of powder! Mr. FZ: Oh, I thought they were suspended in gel or liquid, or something. FZ opens the tin, removes the powder puff, and reveals the Guerlain balls. Mr. FZ is confused and not particularly impressed. Mr. FZ: What are they for? FZ: To make you pretty! FZ: You can use this puff, or a brush, and pick up face powder from the balls. Mr. FZ: Oh, I see. And all the colors mix together? What if you just want to use one color? 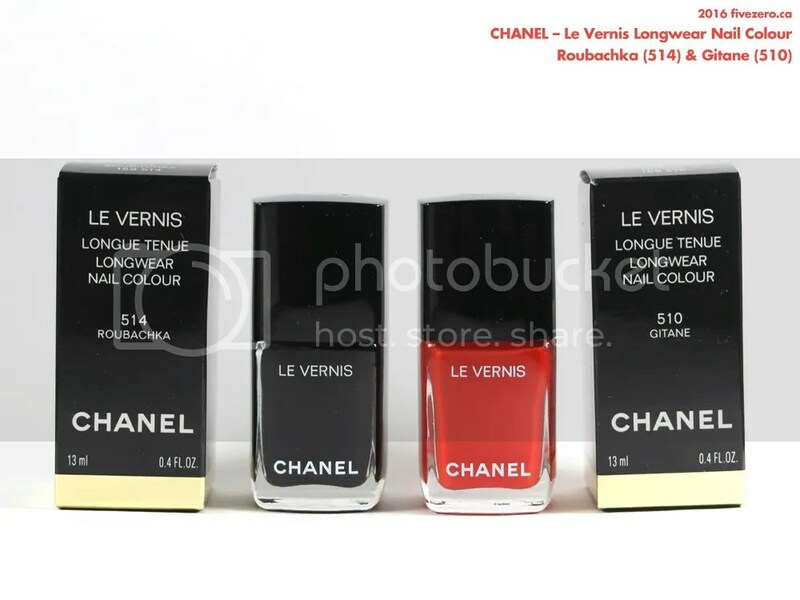 Like the Guerlain lipstick and nail polish, the two Chanel polishes I picked up are also from a new line, Le Vernis Longwear Nail Colour! (I’m a little disappointed that the shade number and name are no longer displayed on the front of the bottle; it’s smaller and on the back, now. The front now looks like it’s missing something, with “Le Vernis” on top and “Chanel” way down on the bottom.) The previous formula still seems to be available, though I noticed that the new line includes some of the older, classic shades like Ballerina, Pirate, Rouge Noir, and Vamp. The two shades I selected were Gitane (510), a vibrant tomato red cream, and Roubachka (514), an intensely vampy purple cream. Yes, I realize it just looks black in my photo. I’ll have to do better for the swatch and review! The Shiseido Facial Cotton wasn’t actually on my list, but there was loads of it on display at Shoppers, both in the regular cosmetic aisle and in the Shiseido display in the beautyBOUTIQUE section, so I picked one up. 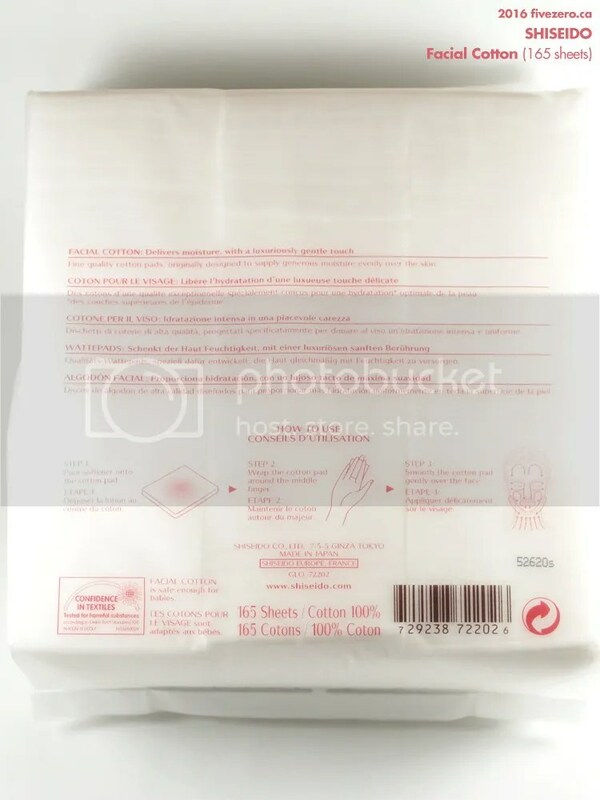 It’s raved about by many, including by Stash Matters, so I’m sure I’m going to love it (especially since I usually just get whatever cheap cotton pads are on sale—I’m using the organic cotton round pads by from KIT by Rexall, at the moment). I suppose, however, that you could argue that the Shiseido pads aren’t part of the redemption haul, since I was more than $11 over the $200 redemption. I also picked up a bag of the new President’s Choice (the Loblaw store brand, and Loblaw owns Shoppers now) The Decadent Chocolate Chip Cookies, Soft Baked (on sale for $2.49, though they’re often on sale for $1.99 at No Frills grocery stores), when I had to go back to pick up DH’s dental floss that I forgot. I’ve tried half a cookie, and while it’s not bad, it’s not as good as the crunchier original—very unusual for me, since I typically prefer chewy cookies to crunchy ones. For good measure, I’ll just add one other item I bought from Shoppers last week, a 30 mL bottle of Roberto Cavalli Nero Assoluto perfume for $19.99! I prefer the original, but this is headier, with notes of orchid, vanilla and wood. I love that it actually smells dark and black, unlike some pretenders. Maybe Nero Assoluto isn’t the best for the upcoming spring and summer seasons, but hey, it’s still pretty darn cold up here! 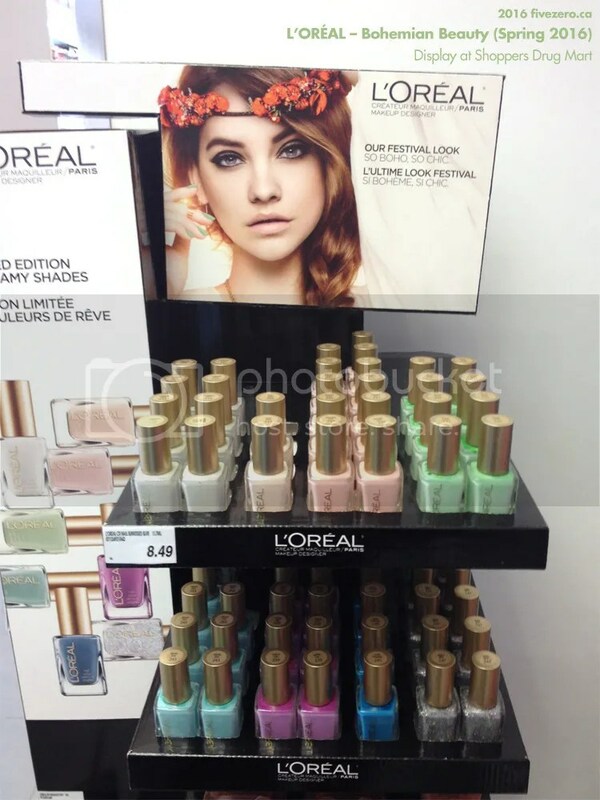 Finally, I saw a display of L’Oréal’s spring collection, Bohemian Beauty, but the nail polishes were going for $8.49 even though the core colors were on sale for $5 or $6. Harrumph. I hate when stores do that. And, I’m not paying/redeeming $8.49 for L’Oréal nail polish, sorry. Isn’t that display a bit odd? Why is there so much less room for the pale shell and bright blue shades? Also, that model looks impossibly bored…and overly Photoshopped! 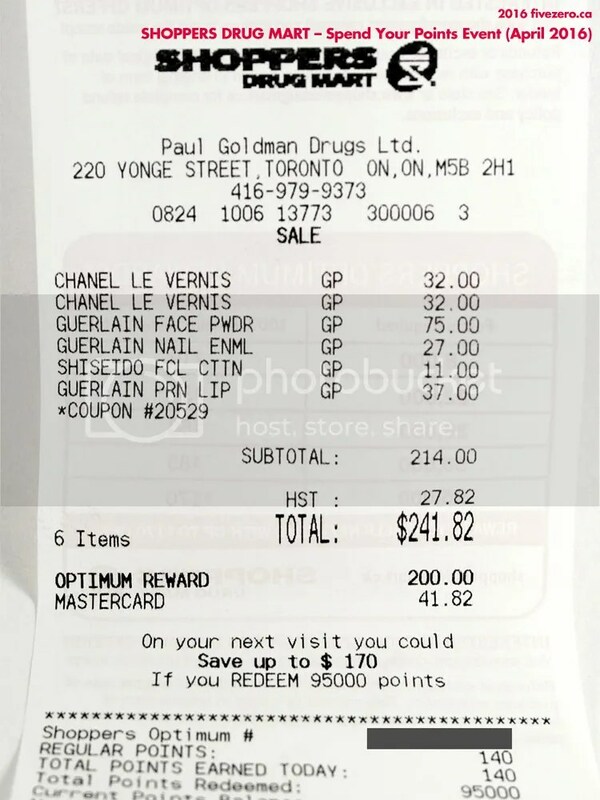 One of these days, I’ll probably have to redeem my Shoppers Optimum Points for a massive haul of regular drugstore-priced items (for $200 I could have nearly 20 Essie nail polishes, depending on the sale). It’s always so tempting to get the more expensive products, though, which rarely go on sale and that are hard to justify splurging on. Did you redeem your Shoppers Optimum Points over the weekend? Great haul! Wow! Finally, you grabbed the gorgeous Guerlain nail varnish and I still remember, we were chatting about the nail polish bottle looks exactly like guerlain perfume bottle. Awesome products and I can’t wait to see more in detail. Yes, I’m so excited about the Guerlain nail polish! 😀 I hope to review it, soon! Looking forward to it. Have an awesome week ahead Chris. 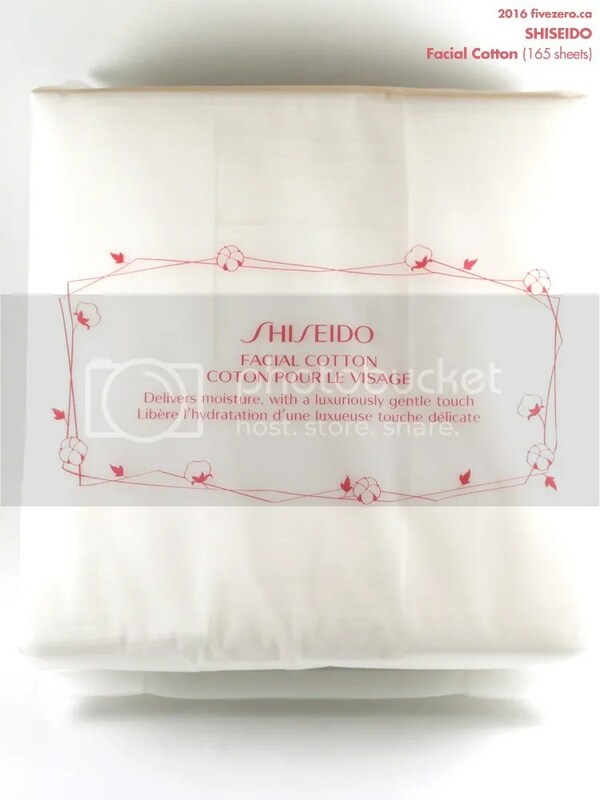 I was just pondering what the most redeemed for item might be during redemption days and I figured it HAS to be the Shiseido cotton. It’s the perfect blend of NEED but with a dash of want. 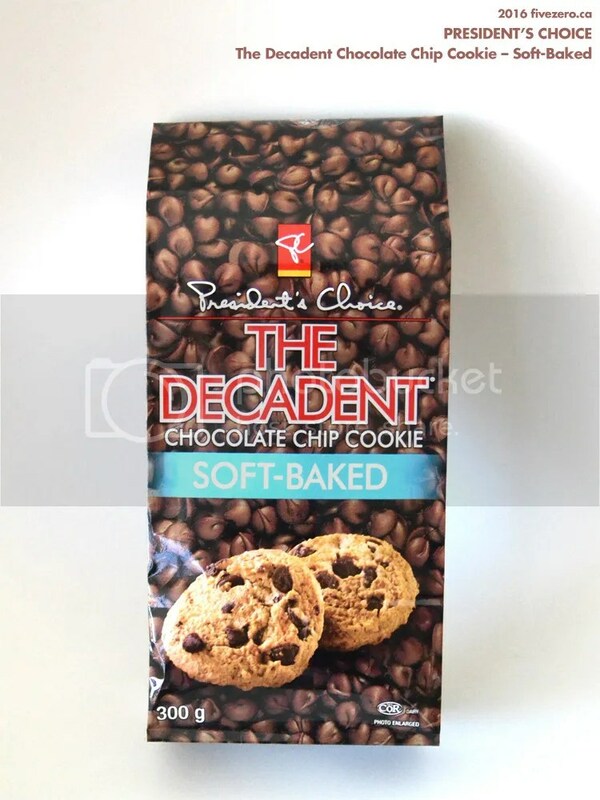 Ooh I haven’t had a PC Decadent cookie in years – and now in soft baked! And oh trust me, I TRIED to redeem just for drugstore makeup last time and it was impossible! I ended up redeeming for higher end stuff to add up to $200. Or maybe I was just picky… just like you, I balked at redeeming for a full priced drugstore item that I knew would go on sale. Whereas, I knew that the higher end brands rarely ever go on sale! LOL I know what you mean about it seeming like a lot for $214! Canadian prices, right? Sigh. I know that when I was picking up stuff and I hadn’t hit $200, I was like…”Really? I can get something ELSE?” 😀 Normally I calculate it all as I go, but the prices weren’t obvious on all items so I just winged it. The packaging is also definitely part of the Guerlain appeal. I mean, I just picked up the lipstick tester and was like AWWW YEAH. I only swatched a couple lipsticks but they all seemed gorgeous! And much cheaper than the Rouge Gs. I have to hide the Meteorites someplace where my DH can’t destroy it, and my son won’t EAT it. I mean they really look like violet candies, don’t they? DH didn’t really react to the smell. I don’t think he has a great sense of smell! Whenever I ask him if he likes my new perfume, he says “Yes”, “No”, or “Meh”. I also would love the Black Perfecto lipstick. Very unusual shade. Oh yummy stuff! I’m addicted to those Meteorites. It’s Cat Forsley’s fault. LOL. She tempted me and I bought them. Hahaha! Blogging is so bad for the wallet! HE SHOOK THE GUERLAIN PEARLS NOOOO! Oh, Roberto Cavalli for a good price is always an insta-buy.